This hand-coloured fashion plate is designed to illustrate a series of garments worn for a specific occasion or activity, either at home, out visiting or taking a walking. Such illustrations were intended to show the clothing illustrated as it should be worn, with all the trimmings, hair styles and accessories essential to create a complete picture of the well-dressed woman, man or child. Le Monde Elegant (trans. The World of Fashion) contained five fashion plates in each of its monthly issues, unlike most other fashion magazines at this time which carried only a single illustration per issue. In this image, the lady of the house (on the right) stands on an enclosed verandah leaning out of a set of French windows framed by an arched opening. She wears a lilac [silk] home dress lavishly trimmed with triple horizontal bands of black (ribbon/velvet) zigzag stripes applied concentrically to the hem of its ‘basque’ bodice, along the edges of split ‘pagoda’ sleeves and around the circumference of the skirt flounce, the scalloped edges of which are all trimmed with matching black silk fringe. A coordinating panel of black [ribbon/velvet] chevrons is arranged over the corsage, rising up from the waist and marking the shoulders, extending across capped ‘mancherons’, or ‘jockeys’, sitting out over the sleeve head. She wears full, white undersleeves – their volume constrained by bands at the forearm and wrist trimmed with small pink ribbon bows above soft scalloped cuffs which fall over the hands – with a matching scalloped white work collar and pink silk ribbon bow marking the high neckline. Her dark hair is arranged in a gently waved version of the fashionable ‘bandeau’ style, with a large roll encircling the back of the head creating a ‘halo’ effect. 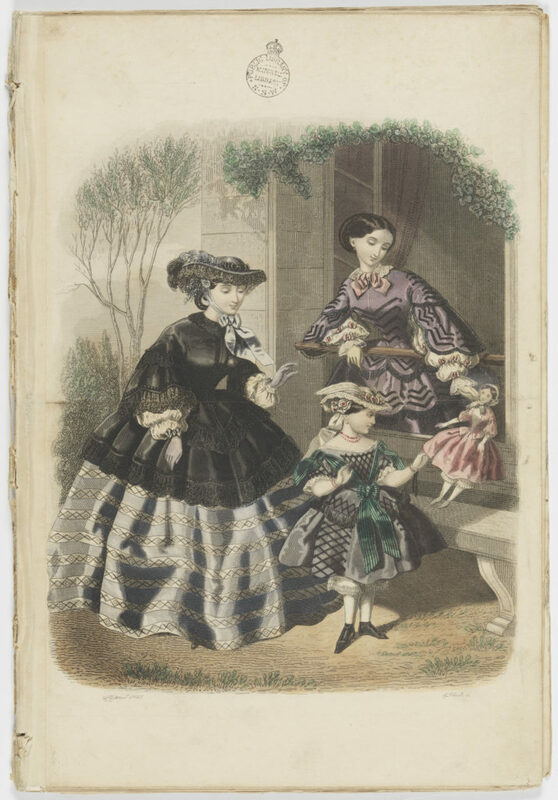 Handing a fashionably dressed doll to a young girl, she also demonstrates the influence of maternal example in the process of inculcating 19th century ideals of femininity on the impressionable minds and pursuits of the young. The girl, probably aged about 10, wears a scaled down version of the complex clothing of her female role models, comprising a low-necked, knee length day dress of grey [silk] with a short-sleeved ‘basque’ bodice and full skirt, trimmed with silk fringing and black braid applied in latticed panels, above white-work embroidered pantalets and slim-fitting, square-toed black patent ankle boots worn with white stockings. Her V-shaped bodice is outlined with striped green silk gauze ribbon bows and streamers. She wears a double string of [coral] beads and a pale straw hat trimmed with ribbon bows, pink silk roses, a white feather and gauze streamers hanging down at the back. The female figure on the left is described as wearing a ‘Promenade Costume’ comprising a ‘walking out’ dress and fitted short coat, known either as a ‘pardessus’ or ‘paletot’, and varying from hip to knee or ¾ length. This black silk, lace trimmed version follows the fashionable silhouette of the day with its double-flounced skirt, inserted sleeve head and ¾ length pagoda sleeves accommodating those of the full-skirted gown of horizontally striped [silk]worn beneath. Her ensemble is further accessorised by a low-crowned blue silk hat with a flounce of black lace applied to the wide curving brim, trimmed in front with black velvet, and on the right side with a blue and black feather; small blue flowers are arranged on each side under the brim, and a pair of pale blue satin ribbons are tied in a bow under her chin. During the early Victorian period hats were quite out of fashion, with the bonnet considered the only proper outdoor headwear for any lady. From about 1857 hats became fashionable again for younger women but only for informal wear in the garden or on the most informal occasions in the country and at the seaside. Straw was the most usual material, though plush and silk were also used for carriage or promenade wear. As seen in this image, hats were commonly low-crowned with wide brims sweeping into upward curves, the edges often bound with ribbon, trimmed around the crown or under the brim with ribbon puffs, flowers and lace, with broad ribbons hanging from the back or from each side which might be tied in a bow under the chin or allowed to float freely. Very often a long feather curved around the crown and a curtain of lace, often several inches deep, was attached to the edge of the brim. Fashion notes ‘of interest to female readers’ were printed in Australian papers extracted from popular periodicals like the ‘World of Fashion’. Colonial newspapers also routinely carried advertisements by local booksellers noting the arrival of the latest issues of leading European fashion magazines: ‘Periodicals for May incl. the World of Fashion – received on monthly basis’, Sydney Morning Herald, 11 Jul 1857, p.9. The Mitchell Library holds a copy of the World of Fashion (vol. 23, Nov. 1846) which bears the signature ‘D.S. Mitchell’ for Mitchell Library benefactor David Scott Mitchell, and is provenanced to the library of his mother, Augusta Mitchell. See: RB/Q050/W927: The World of fashion, monthly magazine, of the courts of London and Paris: Fashions, literature, music, fine arts, the opera, and the theatres. Description based on: January 1, 1845. Held: Jan. 1, 1845-Dec. 1, 1845; Jan. 1, 1847-no. 285 (Dec. 1, 1847); no. 287 (Feb. 1, 1848)-no. 288 (Mar. 1, 1848); no. 327 (Mar. 1, 1851); no. 334 (Oct….). Isabelle Desgrange was one of the more notable and prolific fashion plate artists of the mid-nineteenth century; a daughter of Adèle Anaïs Toudouze, herself a popular artist of the period, Desgrange produced plates for Le Follet, The Queen and Le Monde Elégant (trans. The World of Fashion). The World of Fashion (1824-1891) continued as the Ladies’ Monthly Magazine in 1851, then as The World of Fashion from 1852 -79, and Le Monde Elegant (trans. World of Fashion) from 1880-91. Rather than in a definite or publicly recognized locale, the scene recorded in this fashion plate could take place at any domestic garden in Paris, or any other fashionable place. The flatness of space, two-dimensional nature of the dresses, and stiffness of the figures, as well as their psychologically detached appearance, are all highly characteristic of fashion plate art. The position of figures in these plates has been carefully considered in terms of fashion display and the composition arranged to emphasise the individual details of the clothes and the characteristics that make each garment fashionable. Rendered with meticulous attention so that each dress stands out assertively from the background, the texture of the clothing is subtly detailed through the artist’s play on light and shadow. Isabelle Desgrange, née Toudouze (French, fl.1850–1907) attrib. Subjects are placed in a typically anonymous domestic garden setting. Le Monde Elegant, or The World of Fashion: A Journal of the Courts of London and Paris.